At International Bath and Tile, we work to add a sense of beauty and wonder to your everyday life. Each moment should be cherished, and that includes everyday tasks. What once was mundane now has the opportunity to delight! There is no room in the house with more opportunity to weave splendor into than the bathroom. As one of the most functional spaces in the home, many homeowners overlook the potential charisma in favor of functionality. Not only is this room built into your daily routine; your guests will take advantage of it as well. This is why the bathroom is the perfect space to incorporate elegant design. At International Bath and Tile, we never want you to have to sacrifice form for function. That’s why we want to highlight the skillful blending of sophisticated design with the functionality of DXV by American Standard. They ingeniously weave innovation into the design core of the two most interactive elements of the bathroom. The American Standard Brand launched the DXV designs as a way to celebrate a distinguished 140-plus-year heritage. The DXV collections reimagine the leading design movements throughout the eras by creating luxurious appliances. They feature 4 different movements: Classic, Golden Era, Modern and Contemporary. The Lyndon two-piece elongated dual flush toilet is a true master of geometric precision. Combine this with the slender and unimposing design, and you get a dynamic play with space. This contemporary and minimalistic piece complements a wide range of elegant décor. 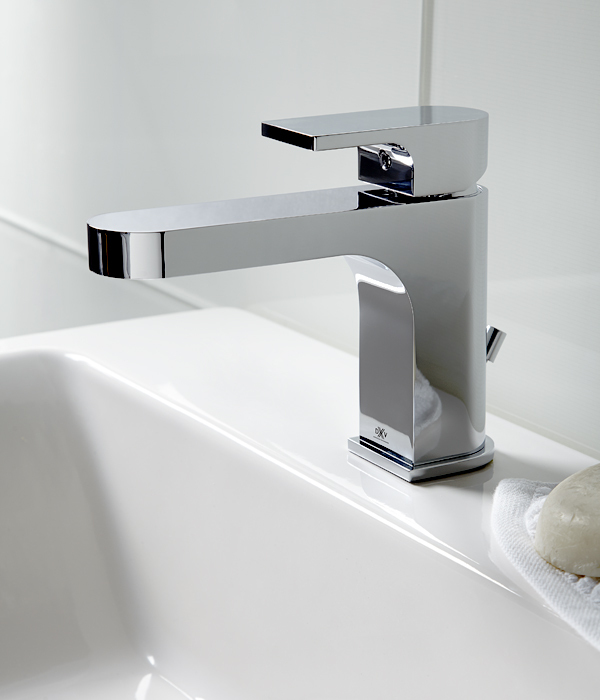 Not forgoing effectiveness, the dual flush is designed for high efficiency. This green element brings efficiency into your home. As with all DXV design, no toilet is complete without the EverClean® surface to protect against stains and odors. 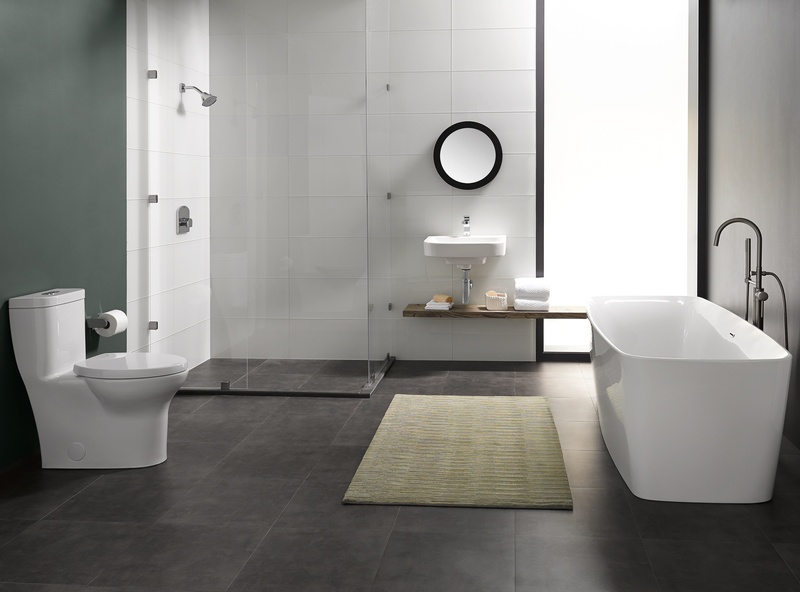 DXV goes beyond creating single pieces, but rather creates entire collections to give your bathroom a cohesive feel. While the entire Lyndon faucet collection would pair well with the two-piece elongated dual flush toilet, we’d like to highlight the Lyndon single lever bathroom faucet. The simple, elegance, and restrained style of the faucet complement the geometric precision so emphasized in the toilet. The sleek stainless steel also brings an aesthetically pleasing element to the room. Many people never look beyond the functionality of pieces in their bathroom. But with the DXV Lyndon collection, pieces that were once overlooked can now bring the design of the whole room together. 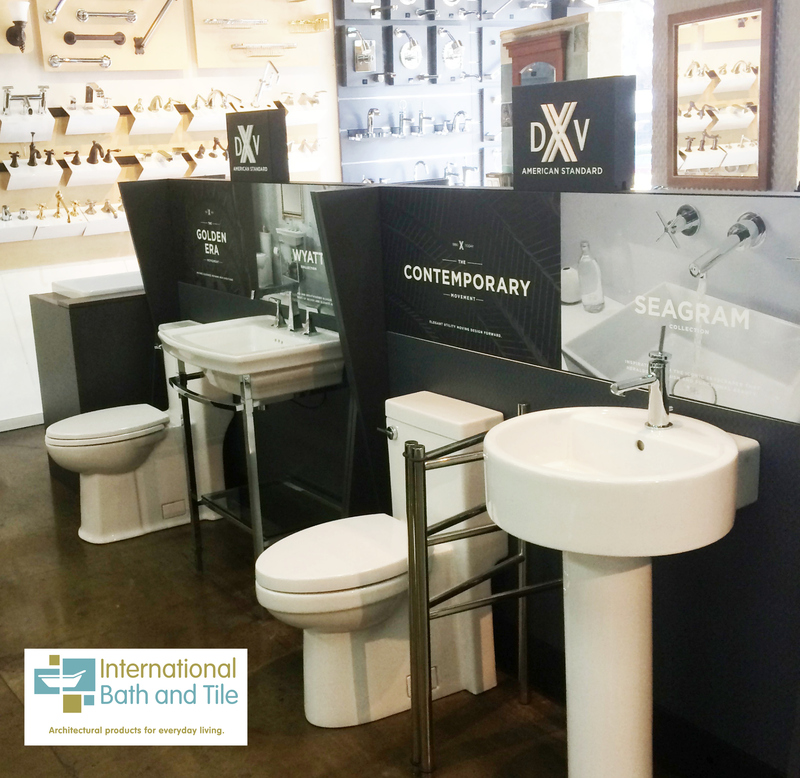 At International Bath and Tile we are honored to be your showroom of choice. You will never have to choose between design and functionality. Here we only offer premier solutions. We have two showrooms in San Diego that help bring together your vision for your home. Make an appointment with one of our consultants today. They work within every budget to help bring elegance and charm to everyday moments.